We could not be happier with this 18-foot bimini that we purchased for our pontoon boat. The bimini top gets its name from Bimini, the island in the Bahamas just a short distance from the east coast of Florida, where the rays of the sun are strong and hot. Bimini tops were first used in Bimini for protection from the brutal rays of the sun during the long summers. Today, bimini tops are popular with boaters in every latitude, but they are considered essential in southern climates. One important factor to consider, if you use a GPS, is the location of the GPS antenna. If the antenna is located where it will be underneath the bimini, the density of the canvas may affect the ability of the signal to pass through. The size and coverage area of the bimini may also be a factor. You may find that it will be necessary to move the antenna to another location in order to get a reliable GPS signal. A bimini cover, or cover boot, for covering your bimini when it's folded down, is important to protect your bimini. A cover boot protects the bimini from damaging UV rays, damage from birds, soil and debris, and rot and mildew. Always be sure your bimini top is completely dry before folding it closed and covering it with the boot. Most custom bimini tops and pre-made biminis will come with a cover boot — but some may not, so be sure to check. 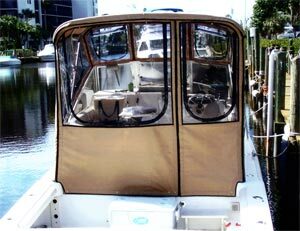 This striking custom bimini top and enclosure provides excellent protection for the boat and its occupants. Quick-release pins are convenient for removing the entire bimini, frame and all, without needing tools. 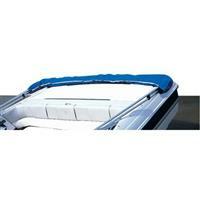 Ready-made bimini tops are available for many of the most popular boat makes and models. 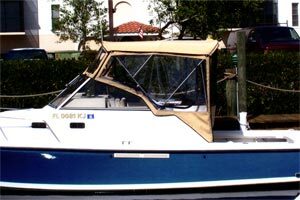 A good-quality pre-made bimini top can be installed easily, and can be purchased for anywhere from a couple hundred dollars for a small bimini to many hundreds for a larger boat. On sailboats, the height of the bimini top should be a few inches below the boom, to allow you to sail with the bimini deployed. When buying a pre-made bimini top for your sailboat, check the height of the bimini against the height of the boom to ensure there will be sufficient clearance. If you like to fish from your boat, a T-top may be a better choice than a conventional bimini, on which the frame is fastened to the sides of the boat. Bimini frames can interefere with your freedom of movement to walk around the boat as needed while bringing in a fish. T-tops are specially designed to permit the full walk-around freedom of movement that fishermen require. Keep in mind that pre-made bimini tops are designed to fit a boat that has had no modifications made to the cockpit area. If you've installed or added any winches, cleats, grab rails, rod holders, or other such items, check carefully to be sure that your modifications won't interfere with installation of the bimini frame. Pre-made biminis should come complete with all needed mounting hardware, straps, and installation instructions. A bimini can usually be installed in a couple of hours. If you're replacing a bimini, your boat may already have mounting brackets installed, but otherwise you'll need a drill and appropriate drill bits to mount the brackets on the boat. Be sure to follow the installation instructions carefully, and be very careful in your measurements for the location of the brackets: "measure twice, drill once." If there are no pre-fabricated bimini tops for your boat, or if you require a custom bimini to accommodate your own particular needs, you can have a bimini top custom made for your boat to your exact specifications. A professional custom marine canvas shop will not only design and sew the canvas cover for your bimini top, they will take precise measurements and do the custom framebending to create the framework for your top — whether your boat is a sailboat or powerboat, dinghy or yacht, runabout, pontoon boat, open walk-around, or cabin cruiser. They will determine exactly what type of bracket mounts will be best for your boat, and will do the drilling and frame installation of your new bimini. They will discuss your needs and requirements, come out to your boat to take precise measurements, fabricate exactly what you need according to your specifications, and professionally install your new bimini top. For most marine canvas fabricators, no job is too big or too small: they can design and make the exact bimini top you want, custom-fabricated to fit your sailboat or powerboat. Online Gym Shop CB19047 Boat Cover Bimini Top White - 63 x 55 in.